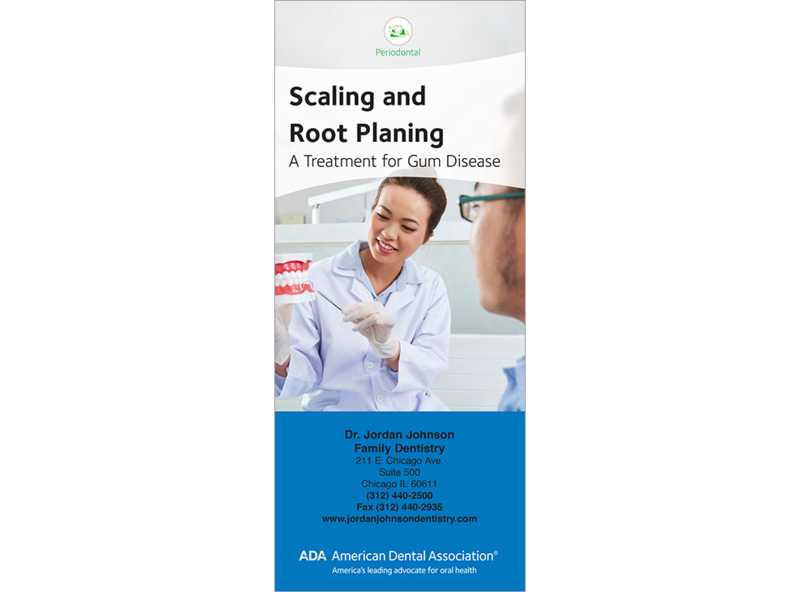 “You don’t have to lose teeth to periodontal disease” forms the central message of this best-selling brochure. It guides patients to accept needed treatment by showing the stages of periodontal disease with compelling graphics. Explains how perio is diagnosed through probing and x-rays. Describes how SRP differs from routine dental cleanings and the benefits of treatment; encourages patients to avoid tobacco and keep follow-up appointments. Also gives tips for post-treatment care and oral hygiene at home. Now includes photos of probing a deceivingly deep pocket and scaling with a curette. Minimum order 150. Click Add to Cart then personalize for free. Now you can add personalized information on the front, back, or both covers on all brochures.